-it assumes that they are somehow entitled to other people’s possessions. -it ignores history. Socialism doesn’t work – period. Ask the people of the former Eastern Bloc countries. Contrast North & South Korea. -it has misplaced faith in human nature. They believe that what makes capitalism a bad system is that it corrupts people when in fact it’s people that corrupt systems. Their solution is to do away with one system and place another system in the hands of corrupt people. They’re willingly ignorant of the fact that socialist governments are corrupt. What makes these airheads think that socialism will make everyone honest and willing to put other’s interests ahead of their own? -Oh, and most importantly, people who believe such nonsense are stupid hippies. Now ask one of these people if they think it’s fair that the top 7% of the students should have all the A’s. Isn’t it greedy & selfish that so few have A’s when there are others who have F’s? Isn’t this an oppressive system that exploits those making lower grades? Ask them how they would feel if their grades were “redistributed” more equitably among the rest of the students. Would the A and B students be willing to give some of their points to the D and F students? Wouldn’t it be wonderful if everybody got a C? Wouldn’t it be more “fair”? Of course, it wouldn’t be so wonderful or fair for the students who worked so hard to earn their A’s and B’s, but hey, at least we’re all equal now. So on the next test, the top students have no incentive to study hard. Why should they? No matter how hard they work, their grades will be taken from them and redistributed in the name of academic “justice”. And those who scored low before also have no incentive to try their best because they’re guaranteed a C. But since there’s no more A’s or B’s to redistribute, the new high grade is C, making D the new average. Isn’t socialism great? Wouldn’t it make you feel all warm & fuzzy inside knowing this is how your doctor passed medical school? So they want a more “equitable” distribution of wealth. I wonder if one of them can tell us just exactly how much more equitable it has to be before they’ll be satisfied and go home to occupy a shower. What’s the number? Unless it’s absolute equality where no one has even a single dollar more than the next person, then any number they come up with will be arbitrary. If redistribution of wealth is the goal, then should we restrict it to the U.S.? Why not include the whole world? Don’t they deserve some redistribution as well? Let’s run the numbers: If everyone put all their money and assets in a huge pile, and if it were redistributed equally among every person on Earth, each person’s share would be $11,000. Watch the deer-in-the-headlights look in the hippie’s eyes as they try in stunned silence to comprehend the inadequacy of this amount to cover basic costs, like rent, food, clothes, electricity, car, fuel, insurance, phone, paying back student loans, etc. let alone extras like money for partying, weed, and travelling to protests with other ignorant hippies. If they still think they’re in the “99%”, let them tell that to people living in Bangladesh or Haiti who would kill to have the standard of living enjoyed by this whiny dependency-minded mob. The most obvious irony is also the funniest, that these people who hate corporations and capitalism gather to demonstrate, having arrived there in vehicles made by one of the Big 3 auto giants that run on gasoline purchased from Exxon-Mobile, and they take pictures and tweet about it on their personal electronic devices that they purchased from evil corporations run by greedy capitalists like Steve Jobs. Another observation about OWS’s decrying of the disparity between the rich and the poor in capitalist vs. socialist societies: Suppose we have a class where the average grade is D and the top grade is C. There’s only one teacher that’s been made available to the students. Now let’s introduce competition in the form of another teacher so that students have a choice. Now the average grade is C with the top grade being A. Notice the gap between the average grade and the top grade has widened, but notice also that ALL scores went up. Now imagine there are a few whiny sourpusses who refuse to appreciate that everyone’s academic standard has been raised, focusing only on the disparity between the top and bottom grades. This is the mindset of the average OWS zombie, so green they are with class-envy (no pun intended). 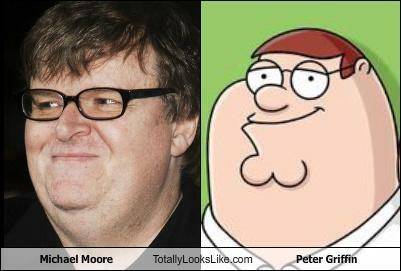 Now Michael Moore says the Occupy Wall Street movement has inspired him to make yet another movie. Yeah, I can’t keep a straight face either every time this hypocrite rails against capitalism all the while making a fortune from the idiots who pay to see his films – films made with non-union labor to boot. Who else thinks it’s unfair that this 1-percenter is among those who possess a disproportionate amount of the world’s body fat? Let’s demand a more equitable distribution of his lunch. Moore can certainly benefit from a redistribution of intelligence. If these people hate capitalism and love socialism so much, why don’t they move to that utopia called North Korea? I could go on, but that’s enough for now. I’m hungry. I’m going to eat food cooked on the G.E. stove we bought from Lowes. 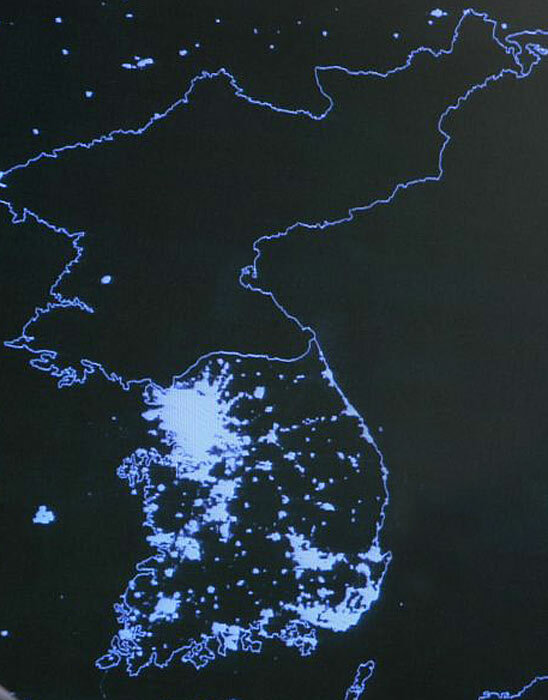 The brightly lit civilized area is South Korea (evil capitalists) The dark area is North Korea (bastion of social & economic justice,progress, and equality) I didn't know Utopia was so dark.